Last week, thousands of developers gathered in Seattle for Microsoft Build 2018, Microsoft’s annual developer conference, to learn how we are empowering them to advance the future of society with AI and the intelligent edge. This week's Azure.Source covers a lot of content. For a more concise (TL;DR) summary of Build 2018, check out the Microsoft press release, Microsoft Build highlights new opportunity for developers, at the edge and in the cloud. For a roll-up of all the Azure announcements, see: Azure Announcements from Microsoft Build. And if you want to dig into all of the content delivered at Build 2018 session-by-session, you can now do so at Microsoft Build Live 2018. New Azure innovations are helping developers write code today for tomorrow’s technology challenges - Scott Guthrie's technology keynote at Build 2018 focused on the key areas of new Azure innovation that enable the intelligent cloud and intelligent edge – spanning developer tools, DevOps, containers, serverless, Internet of Things (IoT), and artificial intelligence (AI). Technology Keynote: Microsoft Azure - Watch the keynote to see how we are helping every developer be an AI developer on Azure. Learn about and see demos of Visual Studio Live Share, Visual Studio App Center integration with GitHub, DevOps with VSTS (including DevOps projects with Azure Kubernetes Service), Azure Dev Spaces, Azure IoT Hub with Azure Functions+Logic Apps, Azure IoT Edge, Azure Cosmos DB, Cognitive Search, and building your own AI models. Azure AI Platform announcements: New innovations for developers - Joseph Sirosh, Corporate Vice President, Artificial Intelligence & Research provides an overview of the announcements made at Build for the Azure AI Platform, which consists of AI Services, AI Tools & Frameworks, and AI Infrastructure. In addition, Cognitive Services add pre-built, cloud-hosted APIs for developers to add AI capabilities, including new services announced at Build. This post also covers Cognitive Search and Azure Machine Learning (ML) advancements. The Microsoft data platform continues momentum for cloud-scale innovation and migration - Rohan Kumar, Corporate Vice President, Azure Data covers announcements of recent Microsoft investments that continue to empower every developer, data scientist, and data professional to do more with data. Unleash the power of data with integrated and highly scalable data and analytics solutions to help organizations capture, store, and process, all data in real-time for driving intelligence into applications, to the edge, and back across the organization. Azure Networking May 2018 announcements - Yousef Khalidi, Corporate Vice President, Azure Networking covers new networking services we have launched as well as enhancements we have made. Launching new services such as DDoS, VNet access to Azure services, zone-aware Application Gateways, a new global scale CDN offering, along with a new and super-fast Load Balancer, we continue to enhance the networking capabilities of Azure and more importantly develop new services and technologies to help customers run, manage, and achieve more when running their most demanding workloads. Azure confidential computing - Mark Russinovich, CTO, Microsoft Azure shares more details about our confidential cloud vision and the work we’ve done since the announcement of our Azure confidential computing efforts. Azure Confidential Computing is aimed at protecting data while it’s processed in the cloud. Delivering on this vision requires us to innovate across hardware, software, and services that support confidential computing: hardware, compute, development, attestation, services/use cases, and research. Learn how you can sign up to request preview access. Microsoft empowers developers with new and updated Cognitive Services - Learn about all of the new updates that came to Cognitive Services at Build for vision, speech & machine translation, language, knowledge, search, and the new Cognitive Services Labs. Cognitive Services Labs provides an early look at technologies that are still in the experimental stage. 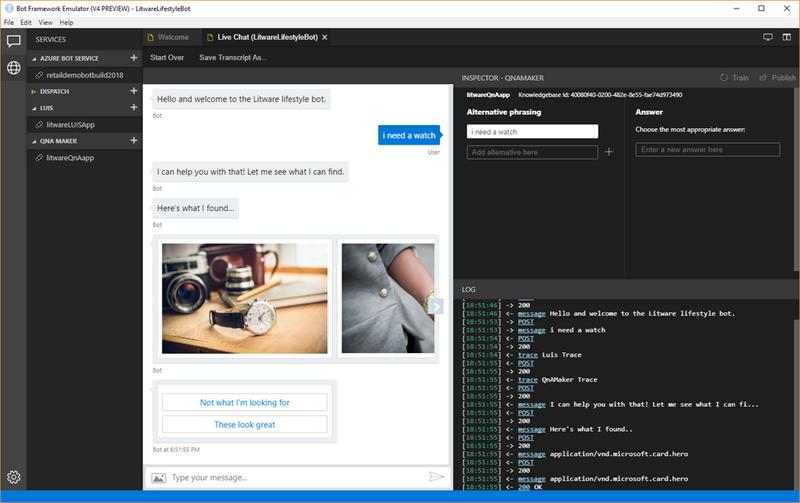 Microsoft Conversational AI tools enable developers to build, connect and manage intelligent bots - Natural interactions with computers start with language, speech, and semantic understanding, and continues through supporting rich multi model interactions. This blog post provides a brief recap of all Conversational AI announcements from Build and takes a quick dive into some of our newly updated services, such as the Bot Framework Emulator. Announcing Cognitive Search: Azure Search + cognitive capabilities - Cognitive Search is an AI-first approach to content understanding. Cognitive Search is powered by Azure Search with built-in Cognitive Services. It pulls data from a variety of Azure data sources and applies a set of composable cognitive skills which extract knowledge. This knowledge is then organized and stored in a search index enabling new experiences for exploring the data. Build 2018: What's new in Azure video processing and video AI - We announced a major new API version for Azure Media Services, along with new developer focused features, and major updates to Video Indexer. Developers can now begin working with the public preview of the new Azure Media Services API (v3). See Build 2018: Video Indexer updates for more info. Full-integrated experience simplifying Language Understanding in conversational AI systems - LUIS brings together cutting-edge speech, machine translation, and text analytics on the most enterprise-ready platform for creation of conversational systems. Learn about advancements in text analytics, translation middleware for bots, improvements to understanding entities and intents, and how we're democratizing ML further. Introducing Project Kinect for Azure - Building on the technology that debuted with Kinect and became a core part of HoloLens, Project Kinect for Azure combines Microsoft’s next-generation depth camera with the power of Azure services to enable new scenarios for developers working with ambient intelligence. This technology will transform AI on the edge with spatial, human, and object understanding, increasing efficiency and unlocking new possibilities. What’s new with Azure IoT Edge? - Learn about the key innovations you will find when Azure IoT Edge is generally available in the next couple of months, including: AI on Azure IoT Edge, Azure IoT Edge core technology, Azure IoT Edge security, using Kubernetes to managed Azure IoT Edge deployments, the Azure IoT Edge modules in the Azure Marketplace, and Azure IoT Edge hardware certification. Developing an Azure Sphere experience with Visual Studio - When looking at the landscape of MCU (Microcontroller Unit, not Marvel Cinematic Universe) development options, we knew we needed to deliver a better experience, which is why we developed Visual Studio Tools for Azure Sphere. The Visual Studio Extension for Azure Sphere adds new application templates to Visual Studio which you can use as the starting point for your application as well as SDK tooling for building and deploying your applications to Azure Sphere devices. Learn how you can pre-order an Azure Sphere development kit from Seeed Studio. 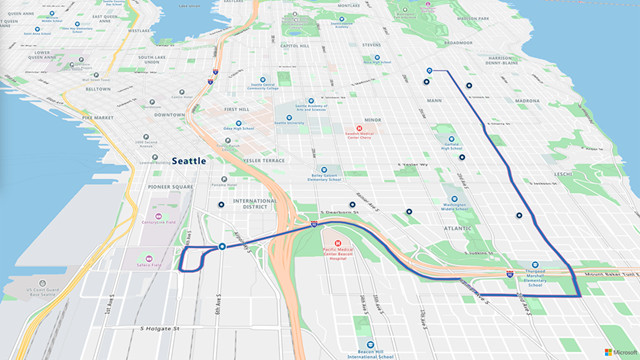 Announcing Azure Maps - Azure Maps (fka, Azure Location-Based Services) is now generally available and provides Microsoft enterprise customers with robust mapping capabilities to integrate into their various applications. Learn what else changed besides the name from this blog post, and from the Azure Friday series below. Enabling more device management scenarios with new features in IoT Hub - Learn about two new features released in public preview at Build: automatic device management, and module identities and module twins. Learn about the scenarios these features enable. Manage Azure IoT Edge deployments with Kubernetes - Learn about an experimental project which lets you leverage your Kubernetes expertise and use the same vocabulary to manage IoT Edge deployments right from within your Kubernetes environment. Azure IoT solution accelerators bring the next wave of innovation - Learn about the next stage in our evolution of customizable solutions: from Azure IoT Suite to Azure IoT solution accelerators. Check out the Azure IoT Reference Architecture, a comprehensive guide for developers and architects wanting to understand technological choices behind a cloud solution for the Internet of Things, and the new Azure IoT Solutions site. Azure #CosmosDB @ Build 2018: The catalyst for next generation apps - We announced several new capabilities at Build 2018 - all of which are intended to enable you to easily build your mission-critical, globally distributed apps. Get a full overview of these announcements in this comprehensive post and read what customers have told us the transformative role Azure Cosmos DB has played in their businesses. Introducing the #Azure #CosmosDB Bulk Executor library - Learn about the Bulk Executor library (available in .NET and Java), which enables you to perform bulk operations in Azure Cosmos DB through APIs for bulk import and update. Virtual Network Service Endpoints for Azure #CosmosDB is now generally available - Azure Cosmos DB uses Virtual Network Service Endpoints to create network rules that allow traffic only from selected Virtual Network and subnets. This feature is now available in all regions of Azure public cloud. Read this post to learn how to use this feature by enabling service endpoint for Azure Cosmos DB for the subnet of a Virtual Network. Sharing provisioned throughput across multiple containers in Azure #CosmosDB - In addition to provisioning throughput for an individual container in Azure Cosmos DB, you can now provision throughput collectively, for a set of containers as well, which allows those containers to share the provisioned throughput. This dramatically simplifies the capacity planning, since you can now configure provisioned throughput at different granularities based on your data model or application needs. Learn how this dramatically simplifies the capacity planning, since you can now configure provisioned throughput at different granularities based on your data model or application needs. Have fun and draw awesome on the cosmic scale Azure #CosmosDB #PxDraw canvas today! - PxDraw is a massive, realtime drawing canvas, that allows you build pictures one pixel at a time in unison with thousands of other people from around the world. PxDraw is built with a variety of Azure and Microsoft technology including Azure Cosmos DB, Azure Functions, Azure Storage, SignalR, C#, TypeScript, and more. 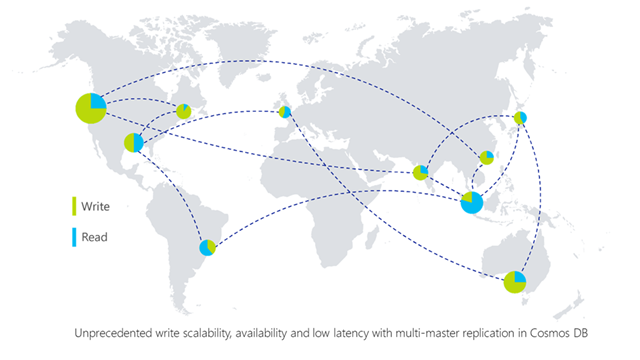 It's designed to showcase lots of writes across a lot of regions while maintaining low latency by utilizing Azure Cosmos DB's mutli-master capability which is now in limited preview. Announcing new Async Java SDK for Azure #CosmosDB - Learn about a new asynchronous Java SDK for Azure Cosmos DB’s SQL API, which is open sourced on GitHub. This SDK leverages the popular RxJava library to add a new async API surface area for composing event-based programs with observable sequences. Azure Container Registry makes geo-replication generally available, adding lifecycle management capabilities - Azure Container Registry geo-replication is now generally available. ACR Build provides inner-loop and trigger-based container build capabilities, and is now available in preview. Lastly, secure by default container registries are now in private preview. Read this post to learn more about these capabilities. Monitoring Azure Kubernetes Service (AKS) with Azure Monitor container health (preview) - You can now rely on Azure Monitor to track the health and performance of your AKS cluster. Read this post to look at the new container health monitoring capability in Azure Monitor, which now is preview. Microsoft syndicates container catalog (mcr.microsoft.com) - This month, Microsoft will start serving container images from mcr.microsoft.com, the Microsoft Container Registry (MCR), and syndicating the content describing the container images with Docker Hub and Red Hat. Learn how this syndication model will enable multiple channels of discovery, with a single download source for Microsoft’s container images. Kubernetes on Azure: Industry’s best end-to-end Kubernetes experience - Read about the simple change of Azure Container Service becoming Azure Kubernetes Service, and then dig into announcements for making AKS easier than ever, new AKS features, and Dev Spaces for Kubernetes. App Service: Adding multi-container capabilities and Linux support for App Service Environment - Announces public previews for multi-container support, Linux support for App Service Environment (ASE), and simplified diagnostics, debugging, authentication, and authorization. Azure SignalR Service, a fully-managed service to add real-time functionality - Announces the public preview of the Azure SignalR Service, which is a fully-managed service that enables you to use ASP.NET Core SignalR to build real-time experiences such as chat, stock tickers, live dashboards, and more, all without worrying about capacity provisioning, scaling, or persistent connections. 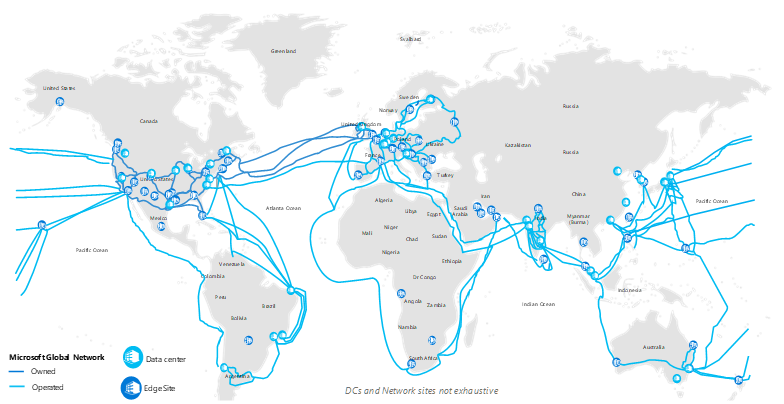 Announcing Microsoft's own Content Delivery Network - Announces the public preview of Microsoft as a provider within Azure CDN, enabling Azure customers to use and deliver content from Microsoft’s own global CDN network, which is being added as an option alongside existing provider options from Verizon and Akamai. Break through the serverless barriers with Azure Functions - Announces the general availability of durable functions, but also announces the preview of Functions Diagnostics by leveraging App Service Diagnostics. Simplifying blockchain app development with Azure Blockchain Workbench - Announces the public preview release of Azure Blockchain Workbench, a new offering that can reduce application development time from months to days. Workbench gets customers started quickly by automating infrastructure setup, so developers can focus on application logic, and business owners can focus on defining and validating their use cases. Introducing the Azure Terraform Resource Provider - Announces a private preview of a new Azure Resource Provider for HashiCorp Terraform that will enable Azure customers using Azure Resource Manager (ARM) to provision and configure dependent resources with Terraform Providers as if they were native Azure Resource Providers. Better integrations and higher productivity with Azure Event Grid - Announces public preview support for a host of new features aimed at improving your developer experience, expanding the list of Azure services that natively integrate with Event Grid, and embracing standards that allow cross cloud interop. New Azure Stack developer features to build intelligent, hybrid applications - Provides a rundown of announcements and a recap of a few key updates since launch. Also announces the preview releases of Templatized Service Fabric and Kubernetes Clusters, which will help you to run microservices and container-based workloads using the IaaS capabilities of Azure Stack. Shared Image Gallery now in limited preview - Announces the limited preview of the Shared Image Gallery, which offers an easy but powerful set of tools to share VM images on Azure. Request your invitation by signing up to express interest. Azure Service Fabric at Microsoft Build 2018 - Provides announcements and updates about Service Fabric, such as the private preview of Azure Service Fabric Mesh, which offers the same reliability, mission-critical performance and scale customers get with Service Fabric, but no more overhead of cluster management and patching operations. 4 new features now available in Azure Stream Analytics - Announces the public preview of Session windows, which group events that arrive at similar times, filtering out periods of time where there is no data. In addition, three private previews are now available for C# custom code support for Stream Analytics jobs on IoT Edge, Blob output partitioning by custom attribute, and updated Built-In ML models for Anomaly Detection. Azure Event Hubs for Kafka Ecosystems in public preview - Announces the public preview of Event Hubs for Kafka Ecosystem, which provides a fully-managed cloud service alternative to installing and running your own Kafka clusters. Azure Database Migration Service now generally available - Announces general availability of the Azure Database Migration Service (DMS), which is designed to enable seamless database migrations with minimal downtime from a variety of sources to the Azure data platform. Azure DMS is tuned to ensure the optimal migration experience, whether upgrading from legacy versions of Microsoft SQL Server or moving from sources such as Oracle, Sybase, DB2, MySQL, and others. 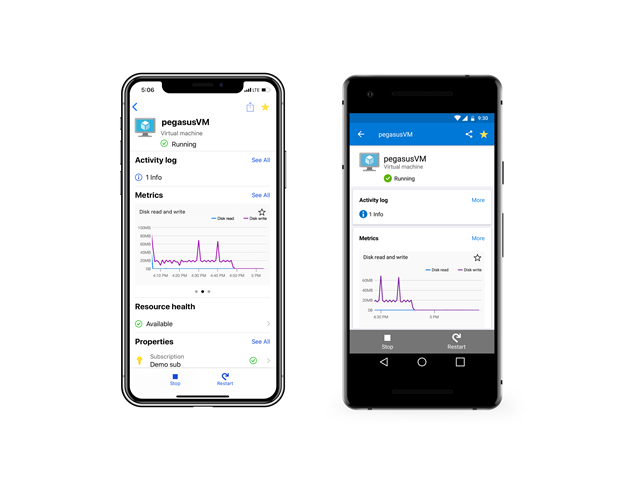 Azure mobile app is now generally available - Announces the general availability of the Azure mobile app, which brings the full power of Azure to your fingertips, no matter where you are. Azure mobile app is available for iOS and Android. New Integrations for GitHub Developers - Announces the integration of GitHub with App Center and Outlook. After connecting a GitHub repo to App Center, developers can configure apps to build on commit, test automatically on thousands of real devices, distribute to beta testers, collect analytics and crash reports, and even upload to app stores when ready for release. Microsoft 365 supports Adaptive Cards, which streamline decision-making for users of Microsoft Teams and Outlook. GitHub has built an Adaptive Card into their notification emails to enable commenting on issues directly from your inbox, and soon you will be able merge pull requests, too. Azure Marketplace is reaching new audiences - Azure Marketplace expands its offerings to include Consulting Services offers on App Source, subscription offers for SaaS ISVs, Private Offers on Azure Marketplace, and a new containers images category. Read this post for the details and dig into the Publisher Guide to learn how to participate. Enhancements in Application Insights Profiler and Snapshot Debugger - Announces a series of improvements on Application Insights Profiler and Snapshot Debugger to ensure you can easily and conveniently use the tools. Azure SQL Data Warehouse now supports automatic creation of statistics - Announces that Azure SQL Data Warehouse (Azure SQL DW) now supports automatic creation of column level statistics objects to provide greater flexibility, productivity, and ease of use for system administrators and developers, while ensuring the system continues to offer quality execution plans and best response times. Extract management insights from SQL Data Warehouse with SQL Operations Studio - Use SQL Operations Studio with Azure SQL Data Warehouse (SQL DW) to create rich customizable dashboard widgets surfacing insights to your data warehouse and unlock key scenarios around managing and tuning your data warehouse to ensure it is optimized for consistent performance. In case you missed it: 10 of your questions from our GDPR webinars - Get answers to ten of the most frequently asked questions arising in the recent GDPR webinar series, which are now also available for on-demand viewing. Azure Friday | Episode 434 - Iterative development and debugging with Azure Data Factory - Data Integration is becoming more and more complex as customer requirements and expectations are continuously changing. Gaurav Malhotra joins Scott Hanselman to discuss how users can now develop and debug their Extract Transform/Load (ETL) and Extract Load/Transform (ELT) workflows iteratively using Azure Data Factory. OpenShift on Azure: The easiest, fully managed OpenShift in the cloud - OpenShift on Azure makes it easier to set up and use with native Azure integration and leveraging the same Kubernetes technology that powers Azure Kubernetes Service. Microsoft and Red Hat jointly demonstrated the OpenShift on Azure offering, the first fully managed and easiest to use version of OpenShift in the cloud. Spark + AI Summit: Data scientists and engineers put their trust in Microsoft Azure Databricks - At Spark+AI Summit 2018 in June, we’ll be showcasing Microsoft’s commitment to helping our customers drive analytics at scale and increase productivity with security, as well as the groundbreaking work of customers and partners that are using our technology to digitally transform their businesses. Learn more about our data and AI services on Azure, especially Azure Databricks. The Azure Podcast: Episode 228 - Live from Build with Donovan Brown and Damian Brady - The first of many episodes recorded live at BUILD 2018. Accelerating AI on the intelligent edge: Microsoft and Qualcomm create vision AI developer kit - At the Microsoft Build developer conference, we announced a partnership with Qualcomm, one of the largest mobile and IoT chipset manufacturers in the world, to jointly create a vision AI developer kit. This will empower Qualcomm’s latest AI hardware accelerators to deliver real-time AI on devices without the need for constant connectivity to the cloud or expensive machines. Customer success stories with Azure Backup: Somerset County Council - Learn how United Kingdom’s Somerset County Council were able to improve their backup and restore efficiency and reduce their backup cost by using Azure Backup. Azure backup provided a simple and intuitive solution for their diverse workload backups and provides the agility to backup their ever-growing data to Azure. Bring the power of serverless to your IoT application and compete for cash prizes - The Azure IoT on Serverless hackathon is an online, judged competition with cash prizes hosted on Devpost. All ideas are welcome, whether you want to work on that sensors-driven smart-home project you have been putting off, build a remote monitoring solution for a healthcare facility, create an intelligent system to streamline the manufacturing process of your production plant, or even create a self-healing robot wearing cool sunglasses. Seven Properties of Highly Secure Devices - This paper from Microsoft Research identifies seven properties required in all highly secure devices, and describes an experiment working with a silicon partner to revise one of their microcontrollers to create a prototype, highly secure microcontroller. Azure IoT Reference Architecture v2.0 - This 61-page document provides an overview of the recommended architecture and implementation technology choices for how to build Azure IoT applications. This architecture describes terminology, technology principles, common configuration environments, and composition of Azure IoT services. In this seven-part series, Scott Hanselman explores Azure Maps with members of the team that build Azure Maps, which is now generally available and was formerly known as Azure Location-Based Services during preview. Azure Friday #410 | What's New for Search in Azure Maps - Julie Kohler joins Scott Hanselman to discuss the newest search APIs that have been added to Azure Maps. In this episode, you'll learn about doing a nearby search, searching within a given geometry and how to search along a route providing a maximum detour time. Azure Friday #411 | Traffic in Azure Maps - Julie Kohler joins Scott Hanselman to discuss how to use the traffic APIs in Azure Maps. You will learn about how to surface the best in class traffic data coming from our partnership with TomTom using a set of simple REST APIs. Get up to date information on traffic flow as well as incidents. Azure Friday #412 | Time Zones in Azure Maps - Julie Kohler joins Scott Hanselman to discuss how to use the set of time zone APIs available in Azure Maps. Learn about how this service is easy to use and how to get up to date information about time zones that change frequently around the world. Azure Friday #413 | Designing with Azure Maps - Azure Maps were designed with the cloud customer in mind. Learn about the cartography design process as well as the robust data behind the curtains. Azure Friday #414 | Routing with Azure Maps - Ricky Brundritt joins Scott Hanselman to discuss the routing capabilities in the Azure Maps Directions API. Azure Maps is a portfolio of geospatial services that include service APIs for Maps, Search, Routing, Traffic, and Time Zones. The portfolio of Azure OneAPI compliant services allows you to use familiar developer tools to quickly develop and scale solutions that integrate location information into your Azure solutions. Azure Friday #415 | Visualizing Data with Azure Maps Web Map Control - Ricky Brundritt joins Scott Hanselman to discuss the rich data visualization capabilities in the Azure Maps web map control. Azure Maps is a portfolio of geospatial services that include service APIs for Maps, Search, Routing, Traffic, and Time Zones. The portfolio of Azure OneAPI compliant services allows you to use familiar developer tools to quickly develop and scale solutions that integrate location information into your Azure solutions.